What is another word for then? 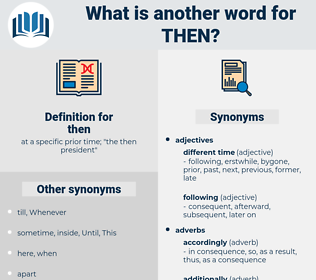 at a specific prior time; " the then president"
Than, before, once, next, while, whereupon. 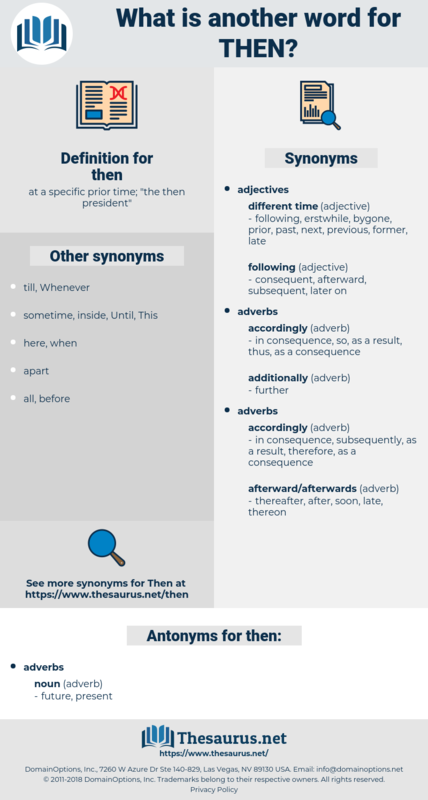 subsequent, erstwhile, contemporaneous, former, next, prevailing. thus, consequently, thereupon, afterward, furthermore, thereby, Since, hence, eventually, best, now, accordingly, finally, immediately, even, moreover, This, lastly, ago, ultimately, henceforth, suddenly, before, meanwhile, otherwise, successively, here, once, soon, anyway, just, nevertheless, hereafter, next, longer, alternatively, though, perhaps, currently, only, instead, forthwith, certainly, whereupon. Then you can have him.